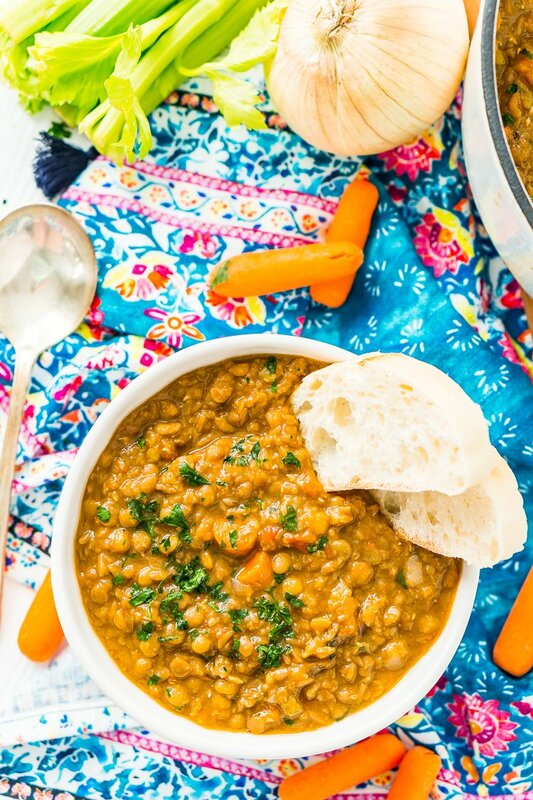 Lentil Soup is easy to make, wholesome — and vegan! Made with a blend of savory vegetables and fragrant spices, it only takes one pot and a little prep to serve up this comforting meal. 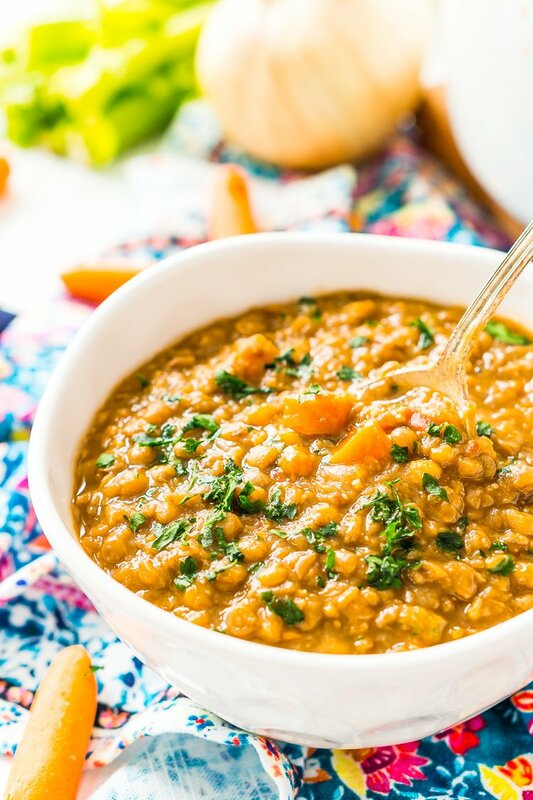 Filled with flavor, protein, and hearty ingredients, this wholesome Lentil Soup is a delicious dinner recipe to keep on hand this fall! It’s no secret that I love easy, cozy meals, and this Lentil Vegetable Soup recipe fits the bill. With just a few simple steps and a little simmer time, you can serve up some steaming bowls of soup for your family any night of the week. JUST TAKE ME TO THE LENTIL SOUP RECIPE ALREADY! 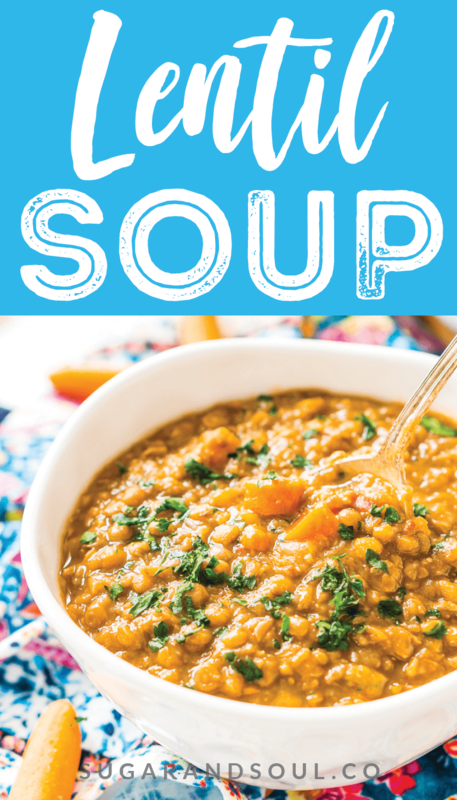 If you’d rather skip my (very helpful, I think) tips and tricks, essential cooking info, and similar recipe ideas – and get straight to this deliciously easy Best Ever LENTIL SOUP Recipe – simply scroll to the bottom of the page where you can find the printable recipe card. To make this Easy Lentil Soup, you only need one pot. The first step is to saute the onions, carrots, celery, and salt in a Dutch oven until the onions are translucent. Next, toss in the lentils, tomatoes, broth, apple cider vinegar, and the remaining spices. Bring the soup to a boil, then reduce the heat and simmer for 35 to 40 minutes. Once the lentils are tender, use a stick blender to puree the soup to the desired consistency. I like to keep some of the lentils whole for a thick and hearty texture. 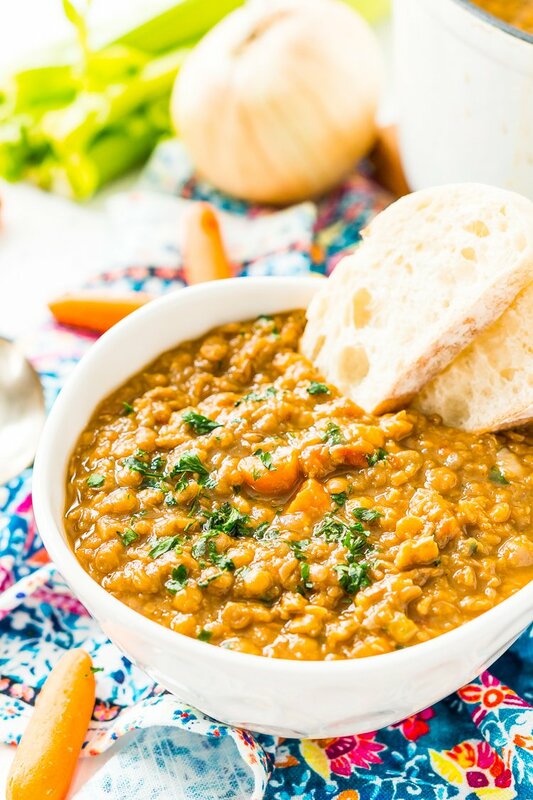 Lentil Vegetable Soup is comforting, but unlike many other comfort foods, it’s healthy! 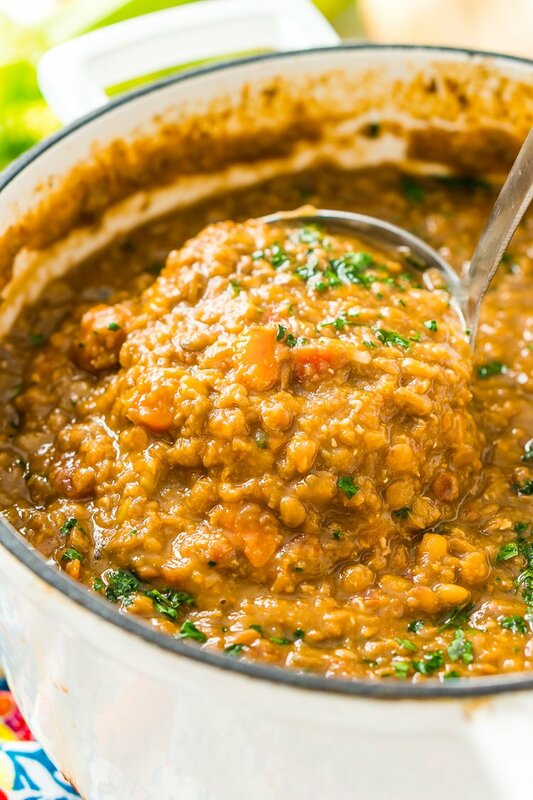 This is actually a Vegan Lentil Soup, so it’s perfect to serve to friends and family who don’t eat meat. With that said, there are a few non-vegan toppings that taste amazing on this soup if you don’t have dietary restrictions. A dollop of sour cream, shredded cheddar cheese, and bacon crumbles are all tasty garnishes to add to your bowl. When the holidays roll around, it’s sometimes nice to eat light in between celebrations. And with the back-to-school season about to be in full swing, you can never have enough easy dinner recipes, right? Soup makes some of the best leftovers. I’d even argue that it tastes better a day or two after you make it when the flavors have a chance to settle. How Do You Freeze Lentil Soup? Freezing this soup is super easy to do! We froze a bunch of it when we were prepping for Evie to arrive so that I would have some easy freezer meals to grab for lunch and dinner! Let the lentil soup cool down a bit before freezing. Fill the bags with the soup and remove any excess air. I find that using a Baggy Rack makes this process a lot easier! Lay the bags flat in the freezer, once frozen, you can stack them as desired. To thaw soup, you can either transfer to the fridge and allow it to thaw overnight OR you can run the bag under hot water to loosen it from the sides of the bag and then transfer it to a saucepan to reheat. 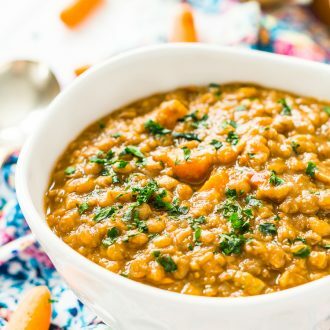 Whether you’re vegan, vegetarian, or just looking for a healthy and hearty meal to serve your family, you’ll find yourself making this simple Lentil Soup Recipe throughout the fall and winter seasons! 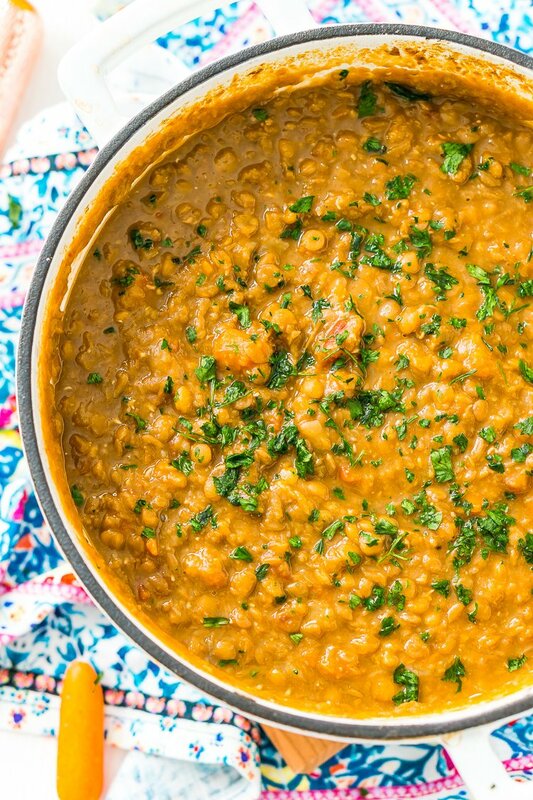 Pin this Lentil Soup Recipe for Later! 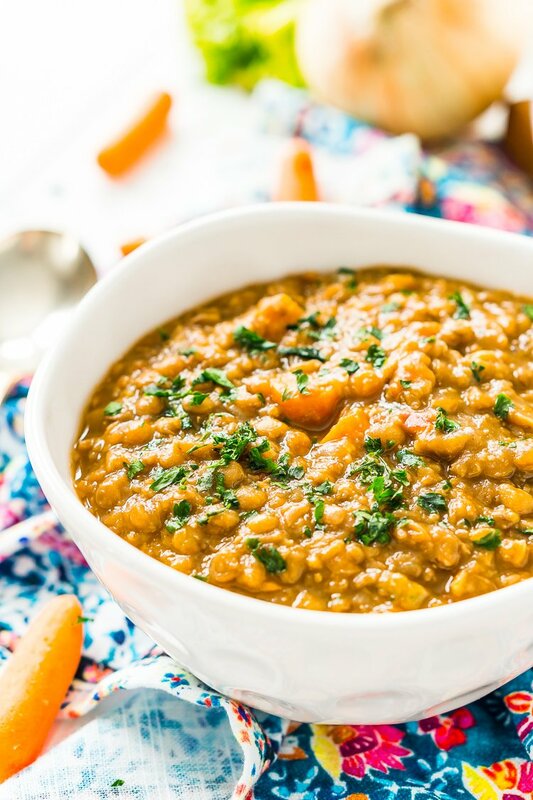 Lentil Soup is easy to make, wholesome -- and vegan! Made with a blend of savory vegetables and fragrant spices, it only takes one pot and a little prep to serve up this comforting meal. Add the olive oil to a large 6-quart Dutch oven and heat over medium heat. Once hot, add the onion, carrot, celery, and salt and cook until the onions are translucent, approximately 6 to 7 minutes. Add the lentils, tomatoes, broth, apple cider vinegar, coriander, cumin, garlic powder, and paprika to the Dutch oven and stir to combine. Increase the heat to high and bring just to a boil.